Custom Glitter Jersey numbers and letters are a new alternative than the old basic vinyl numbers that have been used for many years. With todays technology we can match any font you choose and put the glitter color of your choice on numbers and letters for jerseys, team sports, or whatever the occasion. We can assist with color combinations from shirt to glitter and custom cut the numbers and names to fit any font you desire. Typical turn around time is the same as when we provide any other jersey or t-shirt service. 4-6 Business days. The process of putting names on numbers is not different with glitter, it’s just a different product. These make your names really pop off the shirts and they are different, something you don’t see everyday. Custom glitter comes in teal, purple, pink, gold, silver, blue, green, red, white, and some other cars. They can be custom cut for traditional 6 inch numbers and 8 inch numbers for adults, or any custom desire that you need. Kirkwood Trading Company provides full service screen printing to include custom t-shirts, sweatshirts, sports jerseys, shorts, sweatpants, and everything you need to outfit your business, team, or school in custom logo apparel. Now, you can do so with custom glitter jersey numbers. Through the process with which we customize names and numbers the cost is often less when we cut them in-house. The turn around time is super fast and the quality is impeccable. 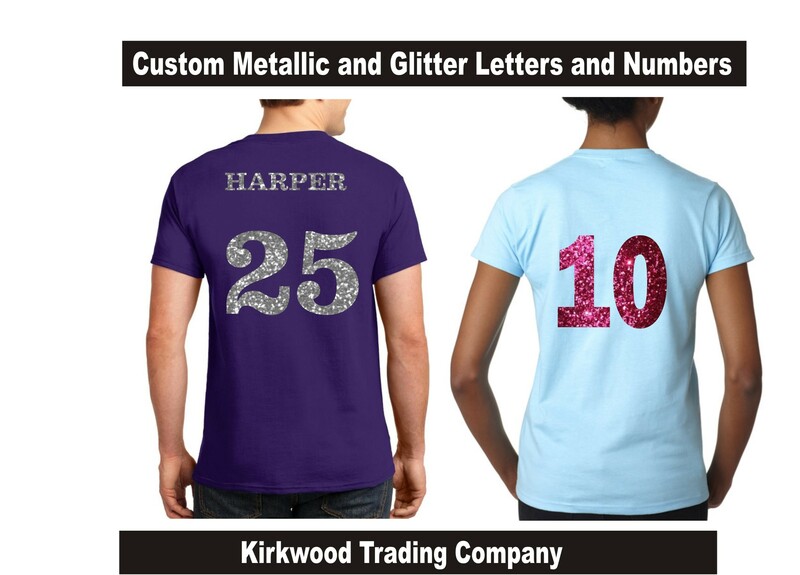 If you have an interest for custom glitter jersey numbers, give us a call or send us an email and we’ll be happy to discuss your needs and what options you have.